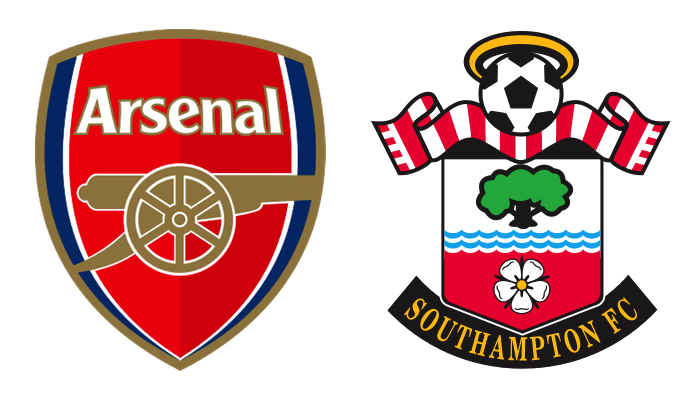 Made plans with the eldest lil'miss to go visit the “Arsenal” pub for the match. Started the day off with a light snack, donned my Tadić kit, and sent Alina up for a kiss from mumma as I got ready to leave. But alas, mumma wanted her in a saints top so she gave her hers (Alina’s kits are all too big and her t was too small). By the time we got off, we were going to be a bit late, like walking up from the pub to the grounds late, i.e. perfect. We got down to Boston and found parking, walked over and got to the pub, after a fair bit of the action. A clanger freekick from Tadić that found a fallen Cech’s rump and bounced in, and a sparkling bicycle kick from birthday boy (how could I forget when the announcers remind us every 5 minutes…) Koscielny that found us even at 1-1 when we stepped in. Naturally we were greeted by a chorus of boos, which couldn’t stand against my bellows of, “We Love Southampton, WE DO!” I found my friend there, the president of the club and we found a spot to watch the last 10minutes of the half, smushed into a crowded area in the back. First play I noted was Ox using his strength to bully Cédric, but then lacking the class to get a killer final ball and give the Gunners the lead going into the break. The last few minutes of the half, Arsenal seemed to settle into controlled possession in the Saints half which ultimately led to naught. The second half started with us at a high top, ordering some hash browns (tater tots with rosemary…?) and an “Irish Breakfast”. Granted Boston is probably the most authentic place in the States to get a breakfast of the islands, but still, it really can’t compare. The bacon was rather dull, the sausage dry, the pudding pretty good, the eggs over done (I don’t presume the Irish are more skilled at egg frying, so this one is on the cook solely). But after a brief recap with 6 screens showing at once.... Cuz that’s what we strove for with modern technology. A TV so large you can make it look like 6 crap TVs piled on each other with images too small to see… well done America, well done. But back to the action. Shlong came on for Rodders (who I admit I had not even noticed at the end of the first half and took his spot wide left (as I recall a rather unnatural spot for him), not sure why he’s not up front with Tadic left and Redmond wide but whatever. Saints start the second half a bit sluggish. Sitting back and letting Arsenal continue to have possession, which is fine, except we don’t seem to be trying to counter. Just get the ball out… we’re not Sunderland, this is a failure in my eyes. A glaring weakness of why we still miss Schneiderlin is our inability to link from the back line or in front of it to a wide front man. Forster is booked for stalling on a goal kick, apparently he was warned earlier. I find it funny that one of the most niggardly teams in the PL would complain about that kind of gamesmanship. Arsenal continue to push with better and better chances. A well place ball in the middle suffers a poor first touch and the lines are cleared for an actual counter. The ball finds Long wide left from distance, and his speculative strike is toothless and easily collected. At 60’ Bellerin rips a shot from a poor angle across the penalty box and inches wide. A minute later Wenger brings on Giroud and Sanchez, this uptick in strength suggests to me immediately that we’re going to be small in midfield with Clasie and Davis. Puel senses the same thing and at 63’ brings off Clasie for Højbjerg. At 66’ Saints are starting to play cohesively a bit and control more. Tadić plays a gorgeous back heel to free up Long down the right, Cech is quick to close out, forcing a chip from Shane that skitters hopeless away from the goal. On the heels of that missed chance Cédric and JFB seem to be disjointed and Sanchez finds acres of space on the left side of the penalty box with no one to mark. He blasts a shot hard and wide and misses by only a bit. The ‘miss’ brigade continues, this time on 71’ as Redmond finds the ball on his feet, but sends it metres over the bar. Saints are definitely seeing more of the ball, connecting the back line to the front better (blame Clasie or praise Højbjerg?) but the same issue Saints seem to always have, is the persistent lack of a quality final ball. That doesn’t stop them from trying though, as Redmond takes the ball down the left and puts in a beautiful cross which finds Long just in front of Fonte, a clean header but sent over the bar again. Another missed chance from Long. Next attack from Arsenal, VVD gains possession deep and tries to clear and switch, but does neither as the ball finds Alexis, who shows us what a quality final ball looks like, to catch Bellarin on the right side again. Another great strike from him is goal bound but the penitent VVD nulls the shot with a solid sliding block. On 79' there’s just too much space being given to Arsenal. I think part of this is an issue I see us having in holding midfield. My only criticism of Alfa last year was his lack of pace and willingness to gamble. Now I see both him and Højbjerg as having this flaw. If they miss a tackle in open space they are never catching the likes of other PL attackers from behind. Another chance for Arsenal to convert pushed wide by the derrière of Cédric. Tadić who, other than the back heel to Long, has seemed to be lacking energy and trying too hard for the ‘hard pass’, as opposed to the easy one. His skillset suggests he knows he’s capable of brilliance and I wonder as he gets tired, if he doesn’t just try to make the fantastic pass rather than the smart one. I do like the change though, as I prefer to keep one of these two in for set pieces and corners, until I think we can trust them to both play 90’ together. A few minutes later Højbjerg has the ball at his feet outside the penalty box, and has the confidence to rip one in on Cech. He can’t contain it as it trickles to his right to Long and an empty net. Long clearly choked on this one, as he timidly tries to pass it inside the near post but his “shot” is so weak that Arsenal are able to recover and nullify the chance. Making it 3 possible chances to take the lead missed and one glaring fail. Saints are really starting to look more and more in control, so naturally something must be done about it. That something was one of the finer players on the gunners squad on Saturday, Cazorla. Cazorla streaks down the left and puts in a beautiful early cross that finds the head of Giroud perfectly between the defenders, his shot hits the corner of the net, outside the post though, so the Arse group moans and I breathe a sigh of relief. The last 5-10 minutes of the match really had all the drama. In the 88th minute Long had possession out right with his back to goal, DIRECTLY in front of the linesman as his achilles is raked by the Arsenal defender. Just clear as day, spikes rolling down the back of his heel, he collapses. No call. A part of me wonders if his chippiness last year means he’s less likely to get calls if he has a reputation as a diver. I hope this won’t come back to hurt us but I’m immediately proven wrong. At the start of extra time Arsenal put a ball in, JFB and Giroud are both entangled, go for the ball, and come down together. The referee points to the spot after what looked like almost every play in the Premier League in the box every week. Perhaps their plan of marginalising Saints back to the ‘mid club’ status they want them in, works best with help from the officials? Maybe it’s just dumb luck. Either way, Santi Cazorla steps up, coolly approaches the ball, sends Forster right, as his strike curls in the space down the middle behind him. Gunners up 2-1 with minutes left in extra time. If I was objective, I’d say this was probably karma for some of our recent wins against them, overcoming odds and time to get points off of the Gunners the past two seasons when we maybe shouldn’t have. But I can’t really think about that now. I just saw a clear penalty ignored on one end of the pitch and a non-penalty called. That being said, it wouldn’t surprise me if JFB is playing a bit too handsy. The officials are giving it more focus this year, supposedly, and when a player is tired or less fleet of foot fouls and shoving often follow. Another year and a long summer on Fonte and I wonder if maybe he isn’t earning some of these fouls over the course of the game. Saints did manage a flurry of excitement in front of the Arsenal goal but just couldn't find the back of the net. Ultimately it was an exciting match to watch with a lot of quality play. I am not ready to pack it in on Puel and by the reaction of the players after the penalty, it seems they aren’t either. I hope that all that’s happening is that Saints will get less attention and expectation and as has been the case in years past, this will see them play more confidently. I expect the Europa group stage will be a great chance to regain some composure, some confidence, and hopefully give me a reason to break out my Harrison Reed kit. A disappointing result from an otherwise not overly disappointing match. The defence could’ve felt tighter, but at the end of the day they gave up one bicycle kick after VVD lost his mark and Arsenal executed a series of headers that found Laurent’s boot. We’re clearly not the ‘shut down’ defence we were at stretches last year, but if we can improve our connections from back to front, then I think this team should have no problem replicating it’s performances of last year. Whether that will come in both Europa and League play consistently, is my biggest question mark.